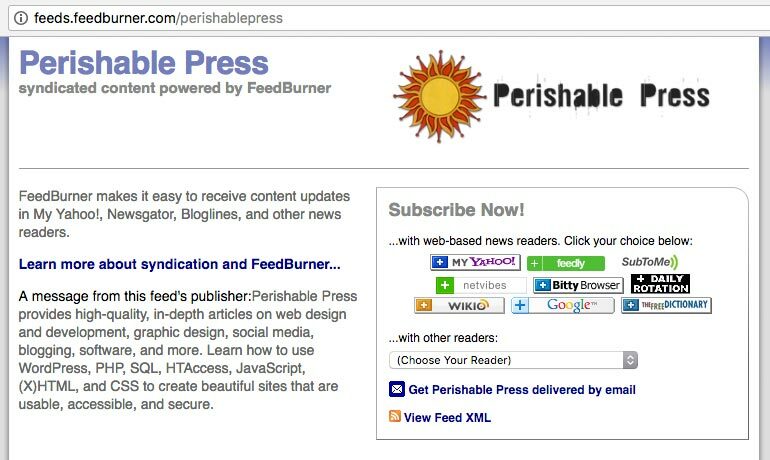 At this point, millions of feed subscribers have Feedburner-branded feed URLs listed in their feed readers. If/when the venerable Feedburner service should ever fail, the results would be disastrous. Feedburner needs to provide a comprehensive way for content producers to deliver their feeds through user-specified channels. Currently, Feedburner demonstrates that this is possible by enabling a partial method of redirecting feed traffic to custom URLs. If you have configured your web server to redirect from your old feed to your new one, you should tell subscribers to use your old, redirected address so that the redirect can work its magic and subscribers always use that address, but FeedBurner tracks 100% of your traffic. FeedBurner will always show that address to potential subscribers instead of the FeedBurner feed address in BrowserFriendly. This is a (cropped) screenshot of my feed’s “user-friendly” landing page. This is the only location at which Feedburner will display your feed’s original URL (via the “View Feed XML” link, as shown in the above screenshot). For those of us preferring to serve our feeds without such a landing page, displaying the original feed URL is currently not an option. Further, as seen in this screenshot, even with Feedburner’s feed-redirection service enabled, the browser’s address bar continues to display the Feedburner URL (e.g., http://feeds.feedburner.com/feedName). In fact, it is only the various subscription buttons that utilize the original, redirected feed address. Unfortunately, many readers simply copy & paste URLs directly from the address bar when grabbing their favorite feeds. Not only should the redirected feed be displayed in the address bar, it should also be served for all feed views — including all non-branded, non-landing-page feed views. If Feedburner is going to support this critical functionality, they should do it comprehensively — anything less defeats the entire purpose. Content producers work hard to deliver content to their subscribers. Services like Feedburner would not exist without such user-generated content, and thus should do anything and everything possible to ensure the success of their users. Sure, nobody wants or expects the mighty Feedburner service to suddenly come crashing down, but if and when it finally does, how many millions of loyal feed subscribers will be left without content? Surely, the impact on both content producers and subscribers would be catastrophic. Even if Feedburner never takes a nosedive, it is vitally important for users to control every possible aspect of their feed-delivery and content-branding strategy. Feedburner has acknowledged the importance of this, and has demonstrated that it is definitely possible to implement.. the only question now is whether or not Feedburner has the will to do it. I, for one, certainly think they do. For the next week or so, I will leave the Perishable Press main-feed landing page enabled along with the partially effective, original-URL redirect activated so that readers may observe the incomplete URL implementation first-hand, without having to log into their accounts to check it out. Thanks for this article. I’d never really thought about this issue with feedburner before, but it’s definitely something to consider. Hopefully soon easier solutions will be created, eliminating the problem! Yes, it would be great to have full control over which feed URLs our subscribers are registering in their readers. Our feeds belong to us, not Feedburner.. – I almost feel as if content producers have “sold out” their syndicated content to Feedburner in exchange for a few statistical tools. You might check out FeedBurner’s MyBrand feature (click on My Account in FeedBurner). It allows you to use your own domain for hosting the feeds — such as: feeds.mydomain.com. It’s a free service and seems to offer some of the features you’re looking for. If FeedBurner was down or if you discontinued using their service, your feed URLs wouldn’t have to change. I’ve been using that service ever since it became free (when Google bought them), and it works well. Hi Daniel, thanks for mentioning this. FeedBurner’s “MyBrand” feature is a potential solution for users fortunate enough to enjoy access and editing privileges for their domain name’s DNS records. Even then, the process of implementing the service (creating CNAME entries, etc.) may not be within the reach of the average user. Thus, although great for an exclusive subset of users, MyBrand falls short of providing the comprehensive URL solution we deserve. If you don’t have accecss to CNAME entry creation, just send an email to your hosting support. Reputable hosting providers usually do the CNAME entry for you. Mine was set in less than an hour after request. I’m on a shared hosting service which is what many people have and it lacks access for this kind of editing. Excellent tip, Phantom — I will definitely ping my host about this. Although, something tells me that not all shared hosting providers will respond as favorably as yours did. Shared hosts that are willing to edit CNAME entries are definitely going above and beyond the call of duty, even if it is a relatively trivial task. Thanks for the idea! Interesting…I still can’t decide if I want to use feed burner or not…but thanks for the article, it’s something to think about.